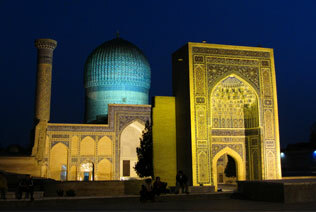 Our longest Tour to Uzbekistan including ancient cities as Samarkand, Bukhara and Khiva offers you not only sightseeing program, but also camel back riding trip, picturesque scenery of Ferghana valley, accommodation in national yurts, visit to silk making factory and oriental bazaars, so you can feel the whole beauty of "Thousand and One Night" Tour to Uzbekistan. Arrival to Tashkent, meet at the airport, transfer to hotel and accommodation. Departure to Samarkand, arrival and accommodation in hotel. Sightseeing tour in Samarqand: Gur-Emir Mausoleum (15c), Registan Ensemble (including Ulugbek (15c), Shir Dor (17c), Tillya –Kari Madrassahs (17c), Bibi Khanum Mosque. Visit to Samarkand bazaar. Transfer to Nurata. Arrival to yurt camp. Accommodation in national Yurts. Camel back riding. Transfer to Bukhara via Nurata city. On way visit old mosque and the ruins of Alexander the Great’s fortress and petrogliph’s. Transfer to Khiva through Kyzyl-Kum desert, and stop on a bank of Amudarya river. Arrival to Khiva, and accommodation. Sightseeing tour in Khiva: Kunya-Ark fortress, including Kurinish Khana (17c); Mohammed-Amin-Khan(19c) Madrassah, Islam Khodja Minaret; Palvan-Kari complex, Abd Al Bobo complex (18c), Rafanek Madrassah, Mohammed Rakim Khan (19 c), Amir-Tur Madrassah, Sho-I-Kalandar Bobo Mausoleum. Sightseeing tour in Khiva: Mazary Sharif Madrassah, Kheivak well (10c), Uch Avlioli ("three saints") Mausoleum, Juma Mosque (18c), Kutluq-Murad Inaq (19c) Madrassah, Pakhlavan Mahmoud Mausoleum, Tash Hauli (“stone yard”) Palace, Alla-Kuli-Khan (18c), Arab Mohammed Khan (18 c) Madrassahs. Transfer to Urgench Airport, flight to Tashkent by HY-1052, at 09.20, arrival at 10.50. Transfer and accommodation at hotel. Continue Tashkent modern city sightseeing. Transfer to Kokand by light vehicles (1-3 person). Sightseeing of Kokand: Khudayar Khan’s Palace (18-19 c); Juma Mosque (19 c); Norbutabei Madrassah (18 c); Royal cemetery. Transfer to Ferghana, accommodation at hotel. Transfer to Margilan to visit silk making Factory Yodgorlik. Continue to Rishtan. Visit famous Uzbek ceramist in Rishtan. Drive to Tashkent, arrival late afternoon. Accommodation at hotel. Transfer to Tashkent Aiport, to take your flight to home. 4-6 pax accommodation in yurt camp with full board.